Probably one of the saddest days in recent memory for Arsenal fans, the day Cesc Fabregas re-signed for Barcelona. Avid Gooner, Sian Macalarny traces the emotional trauma, his departure caused to millions of Arsenal fans around the globe. I had been working at my dad’s office over the summer. Of course rumours had been flying all over the place for months that he was off. I had long resigned myself to the fact he was going, and knew that the fact we’d managed to keep him one extra season in the first place had been a bonus. Still, though, it really didn’t help soften the blow when it was finally confirmed. My sister had sent me a text as I walked to lunch with my dad. “Is he definitely gone then? !” it said. “No, don’t worry,” I replied. “Still rumours… I don’t think he’s definitely gone yet.” But she had me anxious. As we queued in the cafeteria, I checked Twitter again… and there was the confirmation. I follow quite an array of people, so it’s not often my entire timeline is united in its talking point. Felix Baumgartner’s space jump was one such time, as was the opening ceremony of the Olympic Games in July. The other time was the day Cesc Fabregas left Arsenal. He gave us fans eight years of performances that have him very often described as having been the most talented player to have ever played for Arsenal. My personal highlights included his through ball to Emmanuel Adebayor against United at Old Trafford in 2006 – that game you’ll remember no one gave us a hope in hell of winning. I’m not sure why it’s up there – maybe because it marked the last time we actually won there in the Premiership. His goal against Tottenham in our 3-0 win over them in November 2009 brought us the solo goal, the one scored 49 seconds after another former captain of ours had broken the deadlock early in the second half. The match against Stoke City in the Premiership in March 2010 will always be remembered as the day of Aaron Ramsey’s dreadful injury, but it also provided Cesc with the chance to give us one of the best captain’s performances I’ve ever seen. It was also the day he shushed Tony Pulis. Sometimes there are moments in football that simply can’t be improved upon. 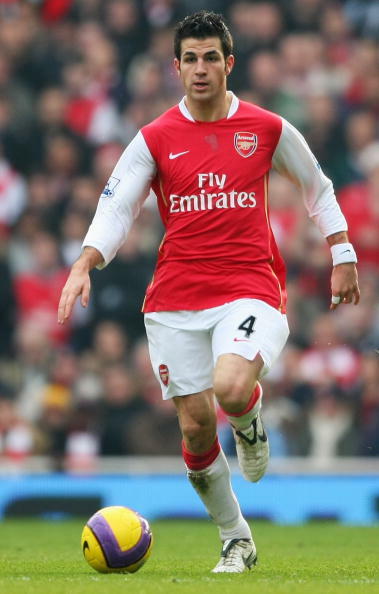 His goal against AC Milan in March 2008 and the ensuing celebration with Arsene Wenger is head and shoulders above all my other Cesc memories – and possibly even most of my Arsenal memories. It has now been wiped from the pre-match montage shown at the Emirates. Understandable, but still a shame, as it was incredibly moving every single time. Calm and composed goal celebrations are all well and good, but even from my seat somewhere near Jupiter up in the away end of San Siro, it was still my favourite goal celebration ever. It’ll always be one of the great Arsenal tragedies that he went to Barcelona. Or rather, that he was at Barcelona first. We’ve seen an awful lot of players leave Arsenal in recent seasons, and most have gone with no more than a ‘Good riddance’. If they’re lucky, we’ll decide to really hate them for a few years. Our most recent captain’s departure was infuriating, but I felt no sadness whatsoever. With Cesc, perhaps it was the inevitability of it, or perhaps it was just that it was the end of an era far too soon, but either way I cried like an absolute baby in that cafeteria when I heard it was certain he was moving. Some Arsenal fans will probably never fully accept that he’s now no more than the one that got away, because he was one of the few who really got it. It’s just a huge shame we got to him second.